Hocking Hills is one of Ohio’s prime spots for R & R and adventure. A couple weekends ago, my husband, two kids (one a freshman in college) and I did both. 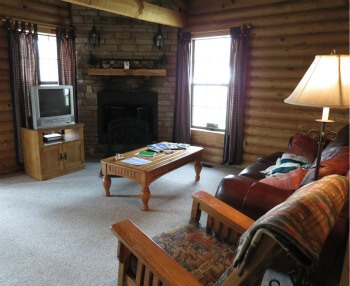 The relaxation part came from our stay in The Jackson, one of the homey cabins of Cabins by the Caves. After living in Columbus for nine years with thoughts about renting a cabin in Hocking Hills, our stay at The Jackson made me wonder what took us so long. What a treat. Due to our time schedule, we didn’t arrive at our cabin until after dark, but the directions that came via email were easy to follow. We pulled into our spot in the woods without a hitch. 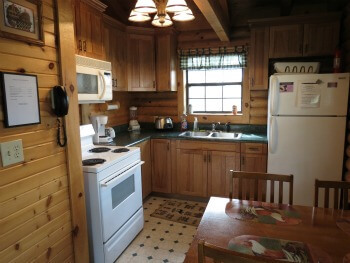 The Jackson, a two bedroom, cozy, upscale cabin with a living room, kitchen, bathroom and an ample porch–big enough for a hot tub and rocking chairs, gave us the idea that perhaps we should chuck all our belongings and move there immediately. Everything we needed was at hand. Coffee maker? Check. TV with satellite? Check. Videos for the VCR? Check. There were board games in a closet and plenty of plush towels to go around. If it had been winter, we could have built a lovely fire in the fireplace. Plus, on the recommendation of the owner, we stopped for groceries in Logan about 20 minutes away before we arrived so we had enough food to last for awhile. If I had thought ahead a bit, I would have bought something to cook up on the cabin’s outside grill. 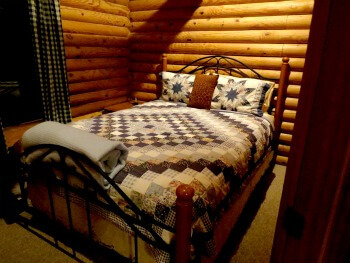 Although within driving distance to stores, restaurants and area attractions, the six cabins and one lodge of Cabins by the Caves are tucked in the woods off winding county roads. Solitude with trees for company is the theme here. 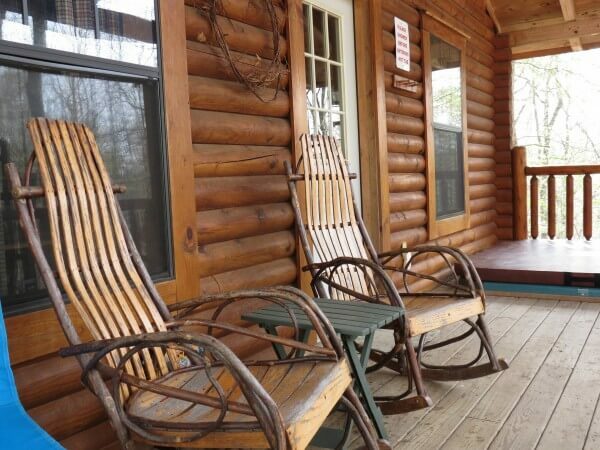 Because of their locations, the cabins are perfect for exploring Hocking Hills State Park. Ash Cave and Old Man’s Cave and Cantwell Cliffs are within an easy drive. 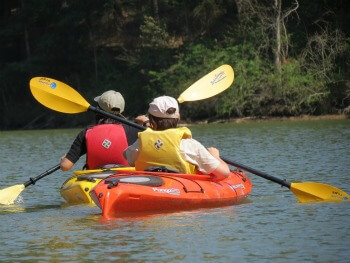 For our adventure, we took in Ohio ATV World, Hocking Hills Canopy Tours, Hidden Haven Sporting Preserve and Shooting Clays, and as a finale, went kayaking with Mimi Morrison of Touch the Earth Adventures on the lake at Strouds Run State Park near Athens. One of my favorite shots of the weekend. My kids at Strouds Run S.P. Cabins by the Caves other cabins range in size from those that sleep 4 people ( Jackson, Sugar Bear, Hillside, McKinley and Firefly) to larger options. The Lincoln sleeps 8 and Starry Night, a 4bedroom, 4.5 bathroom lodge, sleeps 14. None of the cabins are grouped together (although a couple are close to each other) and each has distinctive features–all equally warm and welcoming. Seriously, I could move in and not leave for a long, long while. Disclosure: We stayed at The Jackson courtesy of Cabins by the Caves thanks to another travel writing assignment.